Egyptian archaeologists have discovered four Greek and Byzantine-era rock tombs in a section of old Alexandria's eastern necropolis in an area neighbouring Al-Ibrahimeya tunnel. The site was discovered during excavations carried out by the Ministry of State for Antiquities (MSA) and stretches between the areas of Al-Shatbi and Mostafa Kamel. 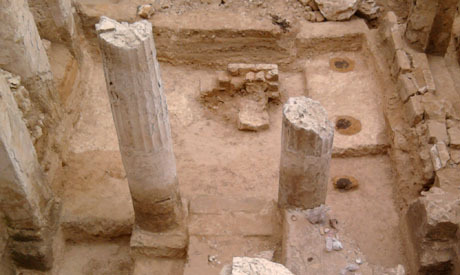 Excavations uncovered four rock-hewn Greek and Byzantine tombs containing a collection of funerary pots, perfume containers and lamps. MSA minister Mohamed Ibrahim stated that the aim of the excavations was to inspect the area for archaeological artefacts before declaring it free for residential building. “It is a very important discovery that adds more detail to the archaeological map of Alexandria,” Ibrahim told Ahram Online. A finely decorated clay container from the second century BC was among the discoveries, he added. Director general of Alexandria antiquities, Mohamed Mostafa, explained that the most important tomb is one dating from the Greco-Roman era which include an open courtyard with two rocky cylindrical columns in the middle. Two burial shafts filled with human skeletons and clay pots were also uncovered. A cecorated 'Hidra' container -- a large pot filled with burned human remains -- was also unearthed along with a tombstone bearing the deceased’s name. Mostafa told Ahram Online that the tomb’s walls still bear layers of plaster and traces of red paintings. The second tomb has eight rock-hewn steps and is located under a modern building; the third and fourth ones are found on a deeper level and house a collection of clay lamps and pots of different sizes and shapes. Within the debris, said Mostafa, archaeologists discovered a small burial site for a woman and her son dating from the late Roman period. Following the discovery, the area will now be declared a protected archaeological site and all construction work prohibited. Reminds me of Tombs of the Kings !